Lots of people dream of owning a Ferrari and thanks to the 458 Italia, there will be a few more. Steve Walker reports. Like any car manufacturer, Ferrari has had its ups and downs over the years. There are models which are revered as classics and those which are routinely shunned but in recent times, it's been on something of a roll. Enzo, F430, 612, 599, even the California was warmly received by those who appreciated the need for it. It looked like the brand could do no wrong but was it building towards crescendo or catastrophe? The answer came as the covers fell from the 458 Italia and applause surged in the air. A 570bhp mid-engined sports car from Ferrari would have been enough to satisfy most but the 458 Italia happens to be gorgeous as well. There are lots of highly desirable destinations for a car budget of over £160,000 but with this package of engineering and design, Ferrari has assembled a compelling case for sending it to Maranello. It's interesting that the period which may soon be looked back on as one of Ferrari's greatest took place at a time when supercar manufacturers were under increasing strain. Growing environmental concerns and, latterly, major financial upheaval are not the preferred back drops against which to retail high performance sportscars costing north of £160,000. In the build-up to the arrival of the 458, Ferrari must also have been feeling the squeeze from a number of rival products dropping into the top end of the sports car market. Lamborghini, Aston Martin and Mercedes-Benz were all flexing their muscles in the sector and McLaren had announced its MP4-12C follow-up to the mighty F1. Looking at these factors and then at the 458 Italia, the only reasonable conclusion is that Ferrari thrives under pressure. Mounted at the heart of the 458 is a phenomenal V8 engine. Based on the same block as the unit in this car's F430 predecessor, it's boosted to a 4.5-litre capacity and revs to a spine-tingling 9,000rpm. The maximum power output of 570bhp is achieved on that rev limiter and it's enough to transport the 458 through the 0-62mph sprint in 3.4s. Guaranteeing the car's supercar status are the facts that it will pass 124mph in 10.4s and reach a top speed on the scary side of 200mph. Power is sent from the mid-mounted engine to the rear wheels via Ferrari's double-clutch gearbox marshalled by wheel-mounted paddle shifters - there's no manual option. Helping to get it all onto the road efficiently is the highly advanced e-diff electronic differential and the F1-Trac traction control system found in the 599. The braking system uses carbon ceramic discs gripped by 6-pot aluminium callipers on the front and four-pot items on the rear. It's enough to get the 458 from 62mph to a standstill in a little over 32 meters. It's a sad reality that most people will never drive a Ferrari 458 Italia and will have to make do with marvelling at it on magazine covers and motorshow stands. It's a beautiful car, so there are worse ways to while away some time but there's also function in its exquisite form. Stylists Pininfarina sculpted the bodywork around the various cooling and aerodynamic constraints laid down by the engineers. The rubber wings inside the frontal air-intake are designed to deform at high speed, closing off the radiator for improved aerodynamics. At lower speeds when more cooling is needed, they allow the air in and it exits through the wing vents at the side of the avant-garde front light clusters. The gearbox and clutch are cooled by the intakes on the elegantly elongated tail, with the air exiting through its mesh sections. Signature styling features include the windscreen that plunges down below the bonnet line and the trio of exhaust pipes flanked by the super aggressive rear splitter. In total, the 458 bodywork produces 140kg of downforce at 124mph with a drag coefficient of just 0.33Cd. The interior is pared down and intensely focused on the business of driving. Steering column stalks have been eliminated, with the controls placed on the steering wheel itself along with the engine start button and the settings for the stability control system. There's a definite Formula One feel to the wheel as a result, but owners won't be able to take it off and carry it around with them. The market for sportscars costing over £160,000 isn't particularly vibrant at the moment but the 458 Italia should have the requisite wow factor to compete with the best of the rest. The Ferrari name still carries enormous weight and there will be little chance of its profile waning while it can churn out products like this. McLaren, Mercedes-Benz, Aston Martin, Porsche and Lamborghini all have vehicles that could be deemed alternatives to the 458 and that's a buying decision that any petrolhead would give their eye teeth to be able to make. Options for the 458 are more numerous than you might think. Buyers can specify diamond finish forged alloy wheels or super lightweight carbon fibre seats. Then there are numerous accessories and features arranged under the headings 'Racing and Track', 'Exterior and Colours', 'Interior and Materials' and 'Equipment and Travel'. Where there's most scope for personalisation is in the almost infinite number of possible trim combinations for the interior. Your Ferrari dealer will wheel out a vast catalogue of different material and colour choices to adorn the car's cabin. Astronomical probably won't do the 458 Italia's running costs justice but little issues like servicing, parts, fuel and insurance will be an irrelevance to the majority of this car's owners. These days, even Ferrari must make some kind of offering at the alter of the environment and the 570bhp V8 does have variable valve timing, high pressure phased fuel injection and innumerable weight saving measures which help efficiency. There's no use pretending their primary focus isn't to help make the 458 go like stink though. For the record, official combined economy is 13.3mpg and CO2 emissions are 307g/km. 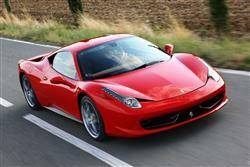 Ferrari's enviable recent record of producing mind-blowing sportscars looks to be in safe hands with the 458 Italia. The stunning bodywork isn't merely an exercise in automotive art, it's sculpted around the machine's need for downforce, cooling, balance and grip. The intensely driver-focused cabin with its F1-esque steering wheel hints at the car's potential but it's when that needle hits 9,000rpm and the V8 is giving up its 570bhp in full that the 458 will reveal what it's truly made of.